Zebra Cake and Sponge Cake | Simple and Delicious ! I am in the infancy of baking and never thought I could post a cake picture and recipe in my blog within a short time. I hope the baking experts here can tell me whether it is "good-looking" or not. However the taste was wonderful. The zebra cake which I tried out is coming from my friend Farida's Azerbaijani Cook Book, and of course the photo is also from her, mine was not beautiful as the original. It was Jeena, who helped me to try out new cake recipes, even sent step by step pictures and patiently answered all my queries. Thanks to Jeena and Farida for your help..
Click here for Farida's Zebra Cake Recipe. For a new baker you are indeed good. Love to have a piece of your cake. sponge cake is so delicious. i used to have that in my school days.i just love this. Wow....the cake looks delicious! It looks soft and yummy! 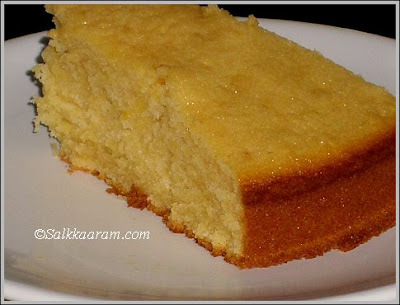 Sponge cake looks delicious Seena! wow Seena what a good looking cake...will be back for more...you have awesome recipes in your blog. I mostly use ghee for making cake, esp. pure ghee. Zebra cake needs patience, I din't take the exact amount of batter while halving it, so my chocolate batter was too much..So didn't get perfect lines.. Thanks for posting the recipe.I tried this and came out good. 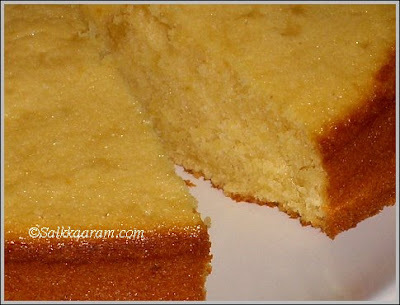 Can you please post recipe for kerala plum cake. Never tried the Zebra sponge cake, but after seeing this recipe, it is a must try. hi seena, i tried ur ghee rice& butter chicken & it turned to be too gud. Ur blogging is very humble & simple. Keep up the gud wrk. Gng2try ur beef fry tmrw. I am very happy with my first successful baking experience. Planning to try other recipes from your site !!! !